For anyone following the news in our industry over the past week or so, you would have noticed that the Aimia Inc. stock price is down over 70%. This follows the news that Air Canada has decided to withdraw from the Aeroplan loyalty program operated by Aimia. At its peak, Aimia was worth over U$2 billion and was the valuation benchmark for transactions like the Affinity Partners investment in Virgin Australia’s Velocity program. Interestingly, Air Canada accounts for only 20% of Aeroplan’s revenue with the remaining 80% coming from other partnerships, some of which are locked in beyond 2020 when Air Canada exits. Air Canada however, accounts for 70% of redemptions, this means that Air Canada is a much more valuable redemption partner than an earn partner. I think this is worth exploring. As part of the agreement, Air Canada guarantees access to 8% of the Air Canada inventory. Last year, Air Canada turned over C$13 billion so the revenue value of this commitment to Aimia is C$1.05 billion. However, Aeroplan only paid Air Canada C$567 million. If you were to gross Air Canada’s earnings, it appears that they are transferring around C$507 million of value to Aimia. Frequent flyer programs were designed in the 80’s when airlines had poor yield management so the programs soaked up excess capacity at marginal cost. In effect, airlines were able to create amazing rewards propositions for customers at practically no cost by giving away otherwise empty seats. Over the last 40 years however, airlines have become much better at yield management with real time pricing models, planes are consistently fuller. This has led airlines to progressively devalue their points currencies clawing back what is now a real opportunity cost. Others airlines have focused on last minute check in upgrades where the revenue opportunity is still truly on the margin. From an Air Canada perspective, Aimia has become a booking agent who gets a 50% discount. 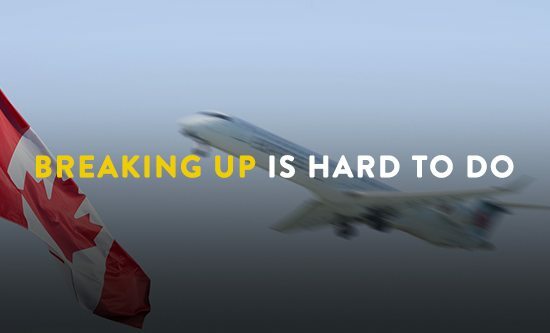 The fact that only 20% of points earned come from Air Canada is also a problem. From an Air Canada perspective, it means the members benefiting from the C$507 million in value provided from Air Canada to Aimia is not aligned to rewarding loyal Air Canada customers which presumably what Air Canada is interested in. Ironically, the program has become so successful as a coalition that is now a victim of that success. Unlike most people, I don’t think this means that the Aimia model is broken. With a few notable exceptions, most of the “Loyalty Programs” I have seen being run as in-house operations leave a lot of opportunity on the table and would be better run by specialists. In a way Aeroplan proves that. Where I think Aimia came unstuck is that they let Air Canada exit as a shareholder. Had Air Canada remained as a shareholder to the program, they might have had a different view of value creation.